For years Jackie Chan has been entertaining U.S. audiences with comical action movies, but "The Foreigner" show cases a more serious side to the action star. 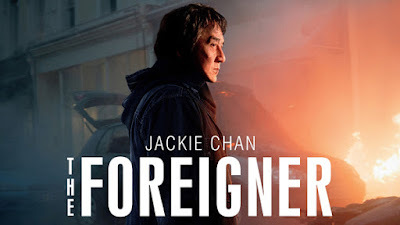 Chan has been doing serious action movies overseas, but had never had the opportunity to bring his acting talents to more than comedy action movies in the U.S.
"The Foreigner" is a dark gritty story of a man seeking out vengeance when his daughter is killed in a terrorist attack. "In Asia, I already found it very tough to slowly change, but for the past 20 years my friends in Asia have accepted that 'Wow, Jackie (Chan) is an actor, not just an action star,'" Chan said. "From Hollywood, I get scripts for police from Hong Kong or police from China, secret police from hong kong, secret police from china, I don't get so many roles from Hollywood." No different roles were offered to Chan until "The Foreigner," his fans outside of Asia had not been able to see anything other than the action star. Through this dark story, the dramatic side of Chan is showcased in a story which has him show an emotional and vulnerable side. Screenplay writer David Marconi said it wasn't intentional that Quan Ngoc Minh, played by Chan, comes off as almost a villain in the first part of the movie because it wasn't what was in the original book "The Chinaman" written by Stephen Leather. "Originally for me, it was a man who...Is caught up in a tragedy," Marconi said. "We have so many tragedies around us, look at Las Vegas, you can just go on and on and on." "The Foreigner" tells the story of a grieving father who has nothing to live for, Marconi said. This gives Quan no other option than to go after the people who took everything away from him. Although he character goes to extremes, Chan hopes that people remember that this is fiction that is based on some sort of reality, but not completely grounded in reality. As a filmmaker, Chan hopes his films send some message to the viewers – peace, respect, unity among other themes – and causes thoughts and discussions. "Right now, there are terrorist attacks every single day around the world," Chan said. "I always said that natural disasters – tornados and tsunamis – happen every single day. Why do humans create human disasters? I choose this movie because I hope we can stop these kinds of things." Chan hopes that the loss of innocent lives can stop, that through "The Foreigner" can help start the discussion to find a solution to the senseless loss of innocent lives.